Take advantage of recreational opportunities offered, including an outdoor pool, an indoor pool, and a fitness center. Additional features at this hotel include complimentary wireless Internet access, wedding services, and a television in a common area. Welcome to the Best Western Sovereign Hotel Albany! When staying at our Albany hotel, a trip to the Crossgates Mall is a must, whether you’re here for an event at SUNY Albany (Albany University) or just getting away from the city. A great academic community, the College of Nanoscale Science and Engineering (CNSE) and the College of St. Rose are also in the neighborhood. We cater to all guests, whether you’re a healthcare professional at Albany Medical Center or simply touring a nearby college campus, our friendly staff members will make you feel at home. Catch a game at the Times Union Center or take a stroll around Washington Park. The Palace Theatre always features exciting shows and don’t forget to attend a SUNY athletic event. They bring athletes and fans to the area from around the country. Take in a Guilderland Soccer Tournament or visit the Saratoga Racecourse for an adrenaline rush. Even if you’re here to take the NYS Bar Exam, it’s important to treat yourself after those months of studying. How about a trip to the Altamont Fairgrounds to see what’s happening? All year-round there are special events taking place. Employees of General Electric (GE®) and Global Foundries® are a couple of our regular guests, and we prioritize business travelers who want to feel at home. 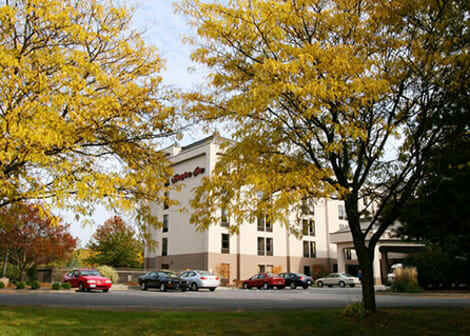 Close to the Amtrak Rensselaer Station and Albany International Airport, traveling is easy at our Albany hotel. Nearby, the NYS Museum and Empire State Plaza are must-sees for vacationers. Tour the capitol buildings and try out some of the local fare. Afterwards, you can rest easy in your spacious room with luxurious bedding. It’s the little touches that make any trip special, and we combine the best in service with the best amenities. Book a room at the Best Western Sovereign Hotel Albany now! Welcome to the new Holiday Inn Express and Suites Albany, NY!Albany’s newest and most modern Holiday Inn Express and Suites Hotel is nestled in the center of Albany County and located on Wolf Road near the crossroads of I-87 and I- 90, at Exit 2 of I-87, minutes to Albany International Airport and located directly across from Colonie Center Mall. Business travelers will benefit from the proximity of our hotel to many Fortune 500 companies, New York State government offices and colleges including the NYS Capitol, College for Nanoscale Science and Engineering, General Electric, SEMATECH, Rensselaer Technology Park, Global Foundries, Tokyo Electron, University at Albany, Siena College, Rensselaer Polytechnic Institute and Union College. We are close to top attractions including the New York State Museum, Empire State Plaza, Times Union Center, Palace Theatre, Saratoga Thoroughbred Race Track, Proctors Theatre and Rivers Casino. If shopping is your pleasure check out Colonie Center Mall and Crossgates Mall. Hotel guests can enjoy our many amenities in our 100 % smoke free hotel including our indoor pool, fitness and business center, complimentary breakfast buffet and our in room microwave and refrigerator. Don’t forget our airport shuttle, parking and Wi-Fi are complimentary. The Sapphire Conference Center and Topaz Room feature 3,600 sq. ft. of flexible meeting space, private entrance, complimentary parking and catering available. 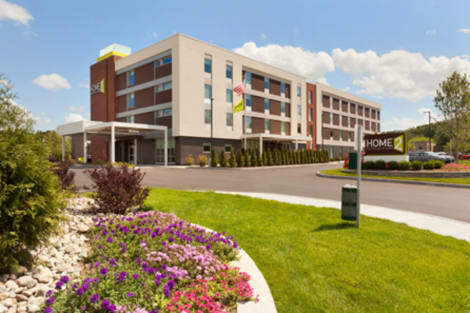 Discover all the comforts of home at Home2 Suites by Hilton® Albany Airport/Wolf Rd. We are just 5 minutes from Albany International Airport, and are conveniently close to major highways (I-90, I-87). 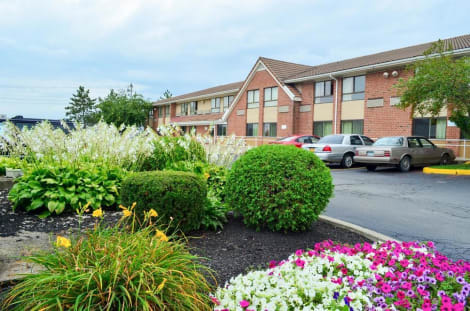 Our extended-stay Albany Airport hotel is a smart choice if you are relocating to the Capital Region, working on a long or short term project, or just visiting Upstate New York. We are walking distance to shops, restaurants and the Crossings of Colonie - a tranquil park with woodland trails and playgrounds. We are also only minutes from a variety of entertainment venues including the Times Union Center and the Saratoga Performing Arts Center.Enjoy free breakfast at our Inspired Table™, which features a selection of healthy options. The Home2 MKT® stocks all the snacks and sundries you’ll need. 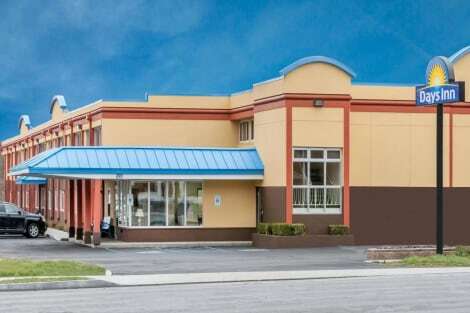 Settle into a comfortable studio or one-bedroom suite at this extended-stay Albany Airport hotel. Customize your space to fit your needs with the flexible “Working Wall”. Feel at home with free WiFi, a media hub and a moveable work/dining table. Your full kitchen comes complete with an induction cooktop, microwave, refrigerator and more. Don’t leave your pet at home – they are more than welcome at Home2™.The hotel features two outdoor areas; one with a cozy fire pit and the other with two gas cooking grills. Refresh in the saline swimming pool and multitask in our integrated laundry/fitness facility, Spin2Cycle, where you can run a load of washing while you exercise.